31 days of October and I hope to bring you a few new(ish?) exciting and fresh blog and social media post ideas. What is your favorite Fall beverage? (ooh see, there's another one you could ask, hehe). Anyhoo, grab whatever it is you enjoy and settle in with us for a bit, while we get those creative wheels spinning for October! 2) Oct. 2nd is "Name Your Car Day". Does your car have a name? Share a pic! 3) What is your favorite Fall scent? 4) Today is National Pumpkin Seed Day! Do you roast pumpkin seeds? 5) Do you play in any Fantasy leagues? How are your teams doing? 7) 2018 is almost here! Did you accomplish your goals for 2017? 8) Do your Fall days differ from Summer days? 9) Happy Thanksgiving Canada! What are your plans for the day? 10) Do you attend Halloween parties? 11) Do you dress up for Halloween, or is that kids stuff? 12) Do you remember your first Halloween costume? Share a pic if you can! 13) Today is Friday the 13th! Are you superstitious? 14) Handing out candy…Yay or nay? 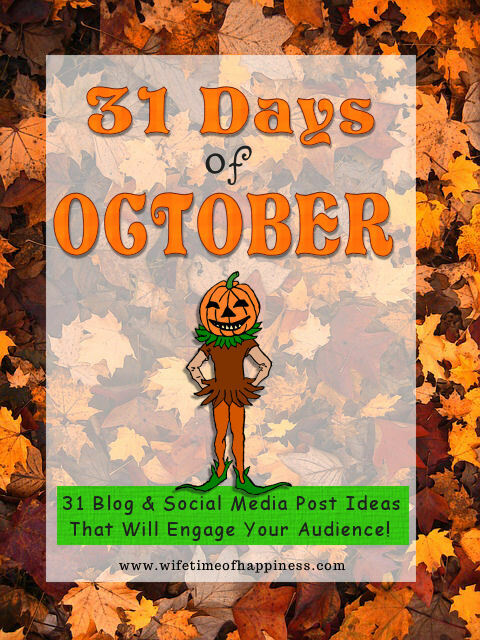 15) Share a Fall inspired article such as "The History of Scarecrows"
16) Do you have a Fall "must-have" list? Share with us! 17) What is your favorite thing about Fall? 18) Fall is perfect comfort food weather. What is your favorite comfort food? 19) Thankful Thursday – What are you thankful for TODAY? 20) Share a "spooky" article. How about THIS one? 21) What is your favorite scary and/or Halloween movie? 22) Do you change up your daily look once the new season begins? 24) What is your favorite "feel good" Fall movie? 25) Do your kids participate in Halloween? What is their costume of choice this year? 26) Do you have a favorite Halloween memory? Share with us! 27) Friendly Reminder! The colder weather is on it's way. Get those oil changes in! 28) What is your favorite Halloween candy? 29) Have you ever been scared by a movie, haunted house etc? Share a story! 30) Do you like carving pumpkins? Do you use a stencil or wing it? Share a pic! 31) Are you dressing up today? Share a pic of your costume! Looking for even more inspiration? Check out my September Blog Challenge post. Thanks for stopping by!